The industrialization of the Soviet economy in the late 1920s and throughout the -1930s was a daunting and complex challenge. The speed at which the Soviets achieved their aim of converting Russia inro a first-rate industrial power was an impressive achievement, but was not without errors and Limitations. One of the most significant restrictions on the development of industry was a lack of experienced technical personnel, especially design engineers. This had a strong impact on the Red Army is armaments programme at the start of the First Five Year Plan. 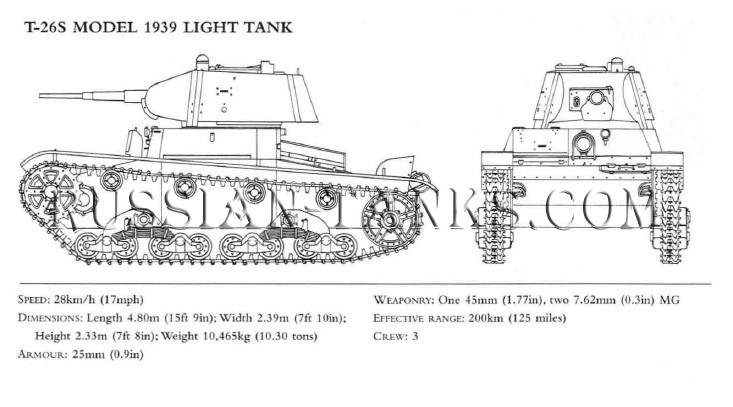 Designs and prototypes for heavy- and medium tanks were rapidly developed, but the numbers delivered to the Red Army were low, because the designs were too complex for the infant Soviet industry. In contrast. the experience gained in light- tank design such as the T-18, and the simplicity of their construction, meant that they could be built in the vast numbers required by the Red Army's mechanization programme (read also tank in action). At the outbreak of war in 1941, light tanks were the most numerous type in the Soviet inventory. Like most Red Army weapons, the design, production and combat roles of light tank types underwent a variety of changes between 1929 and 1945. The initial emphasis on light-tank construction placed them at the forefront of the characteristic pattern of tank design that emerged in the Soviet Union of the 1930s. At the start, Soviet tank design relied on the purchase of foreign tanks, which were either directly copied, or served as the inspiration for native models. By the start of the 1940s, this situation changed as a mature Soviet tank industry evolved original designs from first-generation concepts. The experience of war between 1941 and 1945 led to a decline in light-tank production. In the opening two years of the war, production remained high for three reasons. First, the need to quickly replace the cata strophic losses suffered between 1941 and 1942 (7000 tanks in the first year alone) forced the Soviets to continue manufacturing existing tank types - despite their poor performance in battle - rather than disrupt production with the introduction of improved models. Second, light tanks were simple and cheap to construct. Third, and perhaps most significant, because they did not require scarce armour plate and powerful engines, they could be manufactured in large numbers in smaller and less specialized factories. This was of vital importance between 1941 and 1942. when the evacuation of large Soviet industrial plants to the east in order to avoid capture by the advancing Germans seriously disrupted production of medium T-34 and heavy KV tanks. 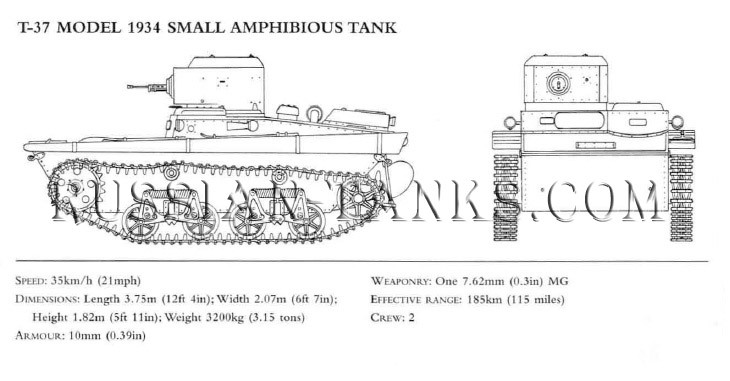 Once the relocation and expansion of the armaments industry was completed in 1942, light- tank manufacture was dimin ished in preference of these heavier, more battleworthy types. Production was terminated in late 1943. The war also saw an increase in the armour and firepower of tanks and anti tank weapons. which reduced the battlefield effectiveness of light tanks, drastically altering their role. 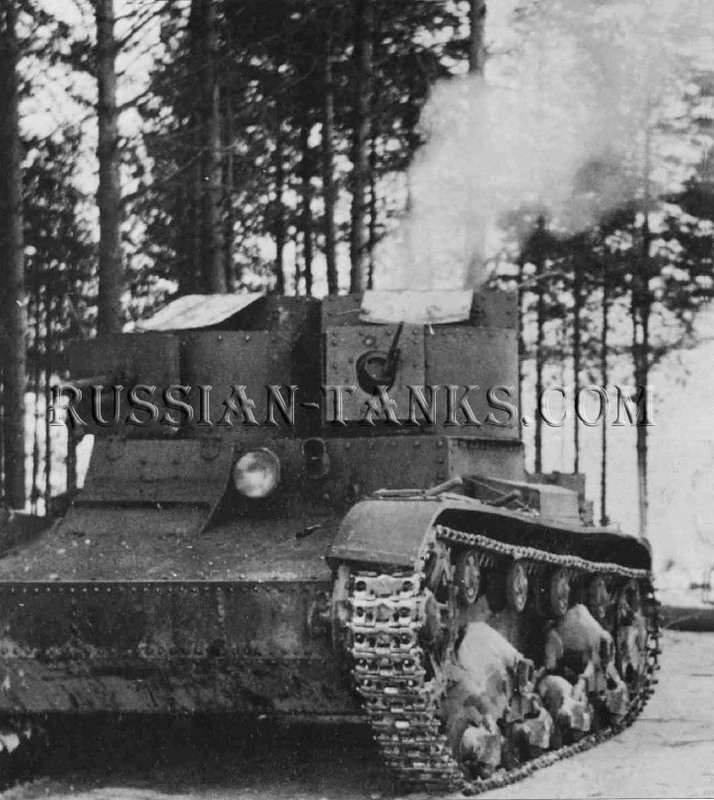 Originally, interwar Soviet military thought had envisaged the use of light panzers for reconnaissance, and in direct support of infantry during the assault. This latter role was gradually reduced during the Great Patriotic War (World War II) because of the increase in defending firepower. which made it impossible, or suicidal, to extensively employ light tanks in an infantry support role. In early 1944, light panzers were removed from tank- and mechanized brigades and regiment. Their infantry support role was completely taken over by the superior T-34 medium tank and SU-76 self-propelled gun, which were available in abundance. The temaining examples of the T-60, T-70 and T-80 light tanks were used for reconnaissance (although armoured cars and British and American Lend-Lease tanks were often preferred), as escorts to supply convoys, artillery tractors, command tanks, and in the role of protecting headquarters. The 13 February 1931 order of the Revolutionary War Council (RVS) to begin mass production of the T-27 tankette signalled the birth of the massive armoured and mechanized formations which were envisaged in the General Staff's Programme for the Armoured Automobile supply to the Red Army. But arguably it was the decision, taken on the same day, to manufacture the T-26 light infantry support tank that heralded the creation of an effective Red Army armoured force. The T-27 was only intended for the reconnaissance role, was the T-26 that was to carry out the first phase of the Red Army's concept of Deep Battle by providing direct support to infantry when breaking through enemy defences. The T-26 was central to conducting future offensive operations. When production ended in 1941, over 12.000 variants had been manufactured. The T-26 was based upon the British Vickers-Armstrong 6 ton (6.09 tonne) E Light Tank, purchased by the Directorate of the Mechanization of the Red Army (UMM), led by LA. Khalepsky, on 28 May 1929. The Vickers E models arrived in the Soviet Union in 1930, but before production began, Soviet designers were allowed to develop their own prototypes based on the British design. Two such prototypes, the TMM-1 and TMM-2, were developed and underwent comparative tests with the Vickers E at the Kubinka testing ground near Moscow. The superior British design was selected for production, under a licence agreement which was previously agreed with Vickers-Armstrong, and designated T-26. 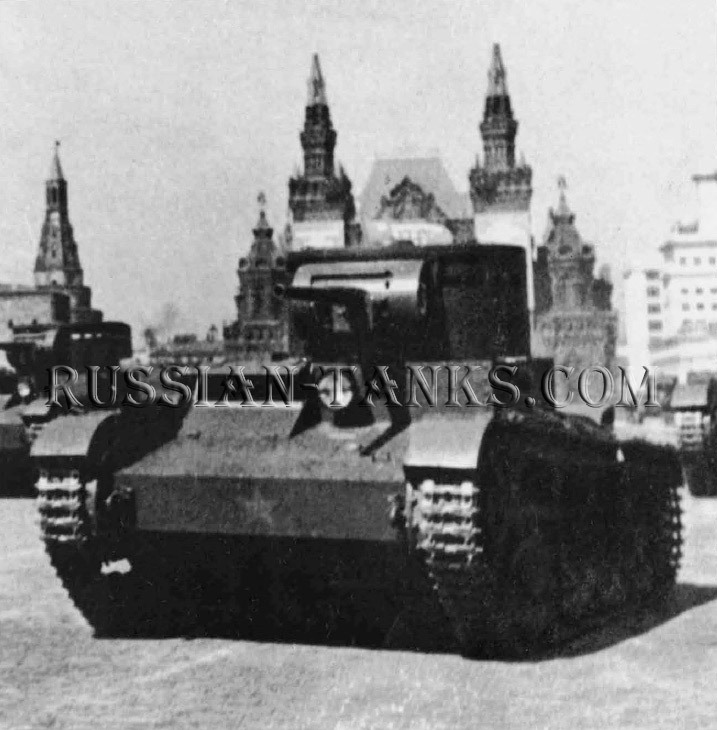 The first large-scale public display of the new tank took place in Red Square on 7 November 1931. T-26 designs between 1931 and 1933 were distinguished by the diversity of weapons installed on them, and most strikingly the use of twin turrets. The standard T-26 support tank was initially armed with two DT 7.62mm (O.3 in) machine guns. A commander's variant was also manufactured with a 37mm ( 1.46in) gun replacing the machine gun in the right turret. An Armstrong-Siddeley petrol engine (renamed GAZ T-26), also manufactured under licence, gave the T-26 a road speed of 32km/ h (20mph) and an impressive road range of 140km (87 miles). The use of twin turrets created some limitations in the tank 's combat effectiveness. The two gunner's seats did not automatically rotate with the turret's mechanism: instead, they had to be swung round manually. Locks were fitted to the turrets, restricting their traverse to 265 degrees in order to prevent them from fouling each other. The use of multiple turrets remained a distinctive feature of Sovier tank design until the late 1930s, but as early as 1933 it was discarded for the T-26 and subsequent light tanks in favour of a single turret. Initially the single turret variant was created by the crude technique of removing the right-hand turret. This proved unsatisfactory because the German Rheinmetall 37mm (1,46in) gun, which was selected for installation in the remaining turret, was difficult to load in the confined space. The turret ring also had a tendency to fracture under the more powerful gun's recoil. The solution to the problem of mounting a larger gun was solved by designing a stronger. purpose-built turret. Designed by the Bolshevik Leningrad factory and KhPZ Kharkov works, the larger turret could mount the new 45mm (1,77in) Model 1932 gun. After further refinements, both the turret and gun became the standard production fit for the T-26 Model 1933, BT-5 and T-35 tank classes. The T-26 Model 1933 became the most numerous production model of the class, with over 5000 manufactured up to 1937. However, thin armour and an underpowered engine meant chat the tank was not universally liked by crews. The riveted armour was dropped after the border clashes with the Japanese in Manchuria be tween 1934 and 1935 revealed that machine-gun fire split the rivet, sending the inner part careening about the crew compartment, with lethal results. After this, all Soviet tank armour was welded. Repeated modifi cations to the engine design between 1931 and 1941 the Soviet Union made only modest improvements from 90bhp (67kW) to 97bhp (72kW). It was in tended to fit horseshoe radio antenna to all tanks, but resources proved inadequate. The large, exposed antenna also proved vulnerable to artillery splinters and was later abandoned. The last models of the T-26 Model 1933 produced in 1936 received two more DT machine guns: one in the turret rear, the other on top for antiaircraft duties. However, by the late 1930s, the limited use of the T-26 in several conflicts rai sed the question about its ability to survive against new direct-fire weapons. https://boris-lozhkin.xyz Lozhkin Boris - vasya Lozhkin.